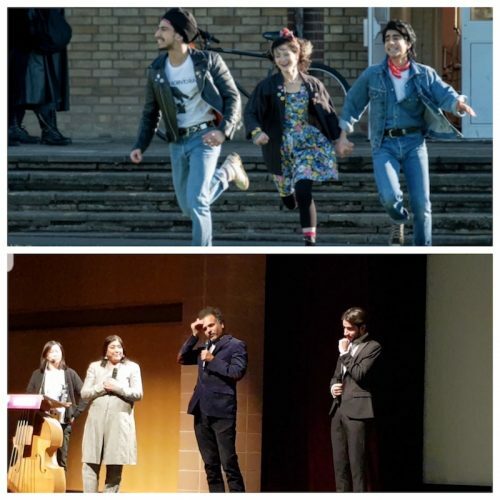 ‘BLINDED BY THE LIGHT‘ is a complete triumph and will be hailed – and applauded – in time, as both a critical and commercial success. Gurinder Chadha, screenwriting partner and husband Paul Mayada Berges, and writer Sarfraz Manzoor (from whose original memoir ‘Greetings from Bury Park’ this has been shaped) have all done a brilliant job in bringing to life the young ‘Javid’ (Viveik Kalra) who lives in Luton, is desperate to get out of the town, nurses an ambition to be a writer, all the while obsessing over Bruce Springsteen lyrics and trying to find his calling. Sound familiar? This is a coming of age drama and beautifully done – Kalra is a find and a star in the making. His smile and fresh-faced good looks will stand him in good stead and he brings a youthful energy and poise to his part. In many ways, as Manzoor suggested in the post screening Q&A section here at the Sundance Film Festival on Sunday evening (January 27), this is a film about fathers and sons. Kulvinder Ghir as Javid’s father is also superb – in fact the supporting ensemble cast including Haley Atwell, Rob Brydon (in a hilarious 1980s mullet) and Sally Phillips are all excellent and give the film an unmistakably British comic sensibility. In these difficult times of division and strife as the 1980s were – the period when this movie is set – Springsteen represented hope to Javid and his journey is one of overcoming racism, prejudice and his own family’s suspicions. Predictably enough, his Pakistani father finds his musings and take on The Boss, less than amusing and dismisses it as ‘haram’ (forbidden) and tells Javid he needs to think about a proper job, not writing, which is really just for posh, white folks. Javid’s friends provide relief from his father’s cultural tyranny – his Sikh friend who first introduces him to Springsteen and a girl who comes into his life a little unexpectedly and a teacher who encourages his creative gifts. Anyone can relate to Javid’s troubles and predicament and that is in no small part to Chadha’s and Manzoor’s script – it will ‘crossover’ as Chadha’s ‘Bend It Like Beckham’ did, wrapping the minority experience in something larger and more tangible and hopefully helping to further understanding and combatting hate and prejudice. The music and plenty of it from The Boss helps to build the narrative and takes us on the same journey Javid goes on. Chadha and Manzoor have a beautiful and grand arc, again achieved without any obvious slights of hand, but natural and meaningful and many may find parallels in their own lives, if not now, then a little after seeing this film, thinking about how their parents made that all important first step of leaving somewhere and coming to Britain. Finally, it was nostalgic to see a daytime Asian rave – they probably haven’t ever been depicted on the big screen before – some of the Americans around acv were a little taken aback and slightly confused. Haha. When Javid and his sister emerged into the daylight, they got it. Chadha has been recorded (by the British Film Institute no less) as the most prolific British woman filmmaker of her generation, and perhaps this is her best and is a fitting tribute to an older generation of Asians who struggled without achieving their dreams, rarely talked about it – but in their children found not just expression but hope and ambition fulfilled – and acceptance and success as (true) Brits. Britons are increasingly divided as a country and a society – ‘Blinded by the Light’ shows us common points of decency and humanity and just as Springsteen’s music is about hope and hurt, and one overcoming the other, so this film is too. Go see it and tell the world about it! Look out for our Red Carpet interviews and video from the post screening Q&A later today! ACV announces special reception for transgender film, ‘Ek Aasha’ at UK Asian Film Festival on March 29 Book Now!